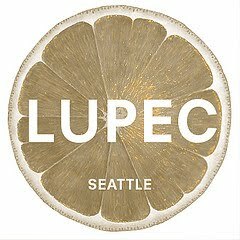 March is not always an altogether beautiful weather month in Seattle, so LUPEC took their mouths on a rum-soaked mental journey to the sunshine and good times of pre-Castro Cuba. With the guidance of Rumba's bar manager, Connor O'Brien, we were transported to front row seats, next to Ernest Hemingway at the El Floridita bar in old Havana. The Daquiri #2 started us out, using (as all the night's drinks did) [name of rum deleted to protect the innocent] rum, allowing the LUPEC ladies a chance to sip a special spirit, one that we would not have been able to find had we just stayed here in Seattle. Any good journey requires a few snacks to keep everyone happy, so Rumba supplied us with plantain chips and guacamole. "Rum is an underdog" Connor told us, comparing its place in the drinking world to where tequila was ten years ago. He launched from there into a history lesson, giving context to all of us on where rum comes from and why it's important--especially the [name of rum deleted to protect the innocent] rum, which we then were invited to taste a flight of: the 3 year and the 7 year. Manager Kate Perry was a blur, getting all the glasses out for the flight--two per person in a matter of seconds. As we delved further into prohibition era laws in the US and the growth of the rum industry and bar scene in Cuba, we were served a third drink, the Presidente. When Connor's very in-depth presentation was finished, the spirit of Cuba and the journey into terrific rums continued with discounts on rum drinks for the rest of the evening. Place all ingredients in glass. Shake, strain in a chilled cocktail shell. Stir and strain into a chilled cocktail shell. Garnish with a flat orange twist.